Oneupweb | Are You Offering Your Blog As A Kindle Subscription? Are You Offering Your Blog As A Kindle Subscription? Well if you’re not, then you should be! According to Amazon Founder and CEO, Jeff Bezos, the Kindle was “the most gifted item ever in our history,” with an estimated 1.5 million sold during the 2009 holiday season. Additionally, Christmas day of 2009 marked the first time ever in which Kindle books actually outsold physical books. Of course, Amazon’s latter accomplishment can probably be attributed to the fact that Kindle gift receivers wanted to play with their new toy after the holiday mayhem wore down, but we’ll still give Amazon credit where credit is due. When you offer your blog as a Kindle subscription, you’ve got a lot to gain—including the opportunity to reach 1.5 million potential new readers as well as the possibility to make a commission from new subscriptions sold. However, don’t expect to get rich from your subscription commissions—most blogs are offered at either $0.99 or $1.99, and come with a 30 percent commission structure. But nonetheless, it’s an opportunity to give your blog a little extra exposure while earning some pocket change at the same time. Step 1: Visit Kindle publishing for blogs (currently in beta) to sign up for an account. Unfortunately, your current Amazon or Kindle accounts won’t suffice as a means for publishing your blog. Therefore, you will need to sign up for a separate account and provide financial information, including bank account information and tax ID numbers. Additionally, you will need a 500×500 pixel screenshot (I recommend a homepage shot), an RSS feed URL and a description of your blog. Step 2: Once your blog passes Amazon’s approval process, you can download a badge (note the badge in the right hand sidebar of StraightUpSearch) from Newstex to help promote it as a Kindle subscription. Simply select the badge design of your choice, enter your Kindle blog URL and copy and paste the code where you want the badge to appear. Step 3: Watch your reader base and wallets grow! 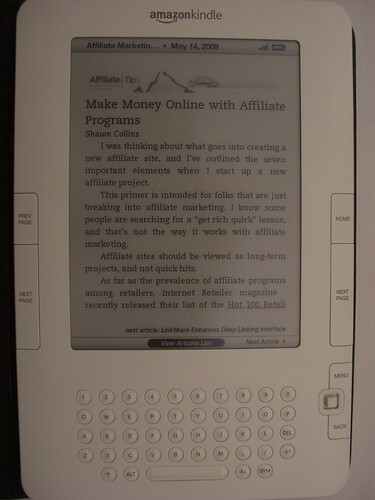 Although the Kindle is technically an e-book reader, it definitely makes sense to offer blogs as a subscription option. And although the cost might deter some potential subscribers, it’s definitely a great alternative for those who want the portability but don’t have wireless access through their mobile phones. From blogs to bestsellers, the Kindle is changing the way consumers digest information. And it’s critical that your business keeps up with this ever-evolving marketing landscape. To learn more about the changes your business needs to be making to ensure success in 2010, contact Oneupweb. We’d be happy to help.